Baja 30 Outlaw: Take it to the next level. 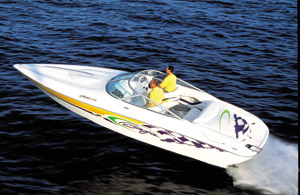 There are seven models from 20 to 40 feet in Baja's Outlaw series of powerboats. On numbers alone, odds are good that if buying an Outlaw is in your plans, you'll be able to find a model that closely, if not precisely, fits your needs. And if the transition from a single-engine boat to a manageable, affordable model with twins tops your list, the 30 Outlaw is your boat. The 30-foot-long, conventional V-bottom we tested was a breeze to drive, ran more than 75 mph and cost less than $165,000. 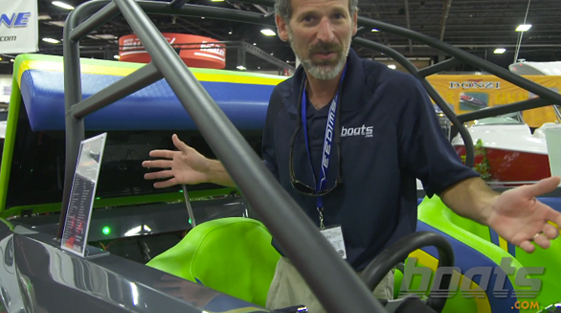 Baja's designers continue to stick with conventional V-bottoms, rather than stepped hulls, throughout the product line. To this end, they likely sacrifice a little top speed. They also don't risk compromising turning stability. 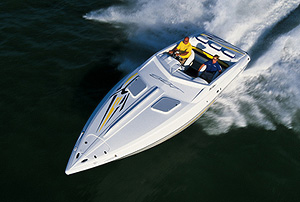 The 30 Outlaw carved slalom and full-circle turns in a deep, pure and comfortably reassuring manner. You might find a more nimble 30-footer, but you won't find one that tracks any better through corners, as well as in a straight line, whether the driver hammers the throttles or pulls them back. In 2- to 3-footers offshore, the 24-degree hull handled seas from all directions. Though it would be a stretch to say the 30 Outlaw "dominated" those waters, it did handle them. The only noise we heard, above the roar of the twin 425-hp MerCruiser 496 Mag HO engines and the hull on the water, was a rattle from the cabin door area. Mercury Racing 280S K-Planes made traversing cross-seas more manageable. 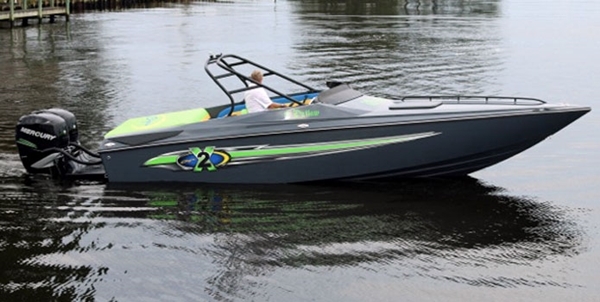 Top speed for the 30 Outlaw, with Bravo One 15 1/4" x 28" lab-finished four-blade stainless-steel propellers on its 1.5:1 Bravo One drives, was 76 mph. That should be plenty fast for first-time twin-engine boat owners. 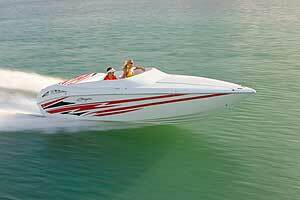 And, after coming on plane in 4.7 seconds with the tabs down, the boat reached almost 70 mph in 20 seconds. Midrange power was solid enough for the 6,900-pound 30-footer to run from 40 to 60 mph in less than 6 seconds. 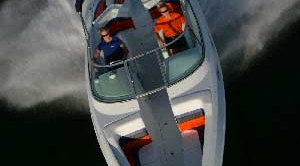 The 30 Outlaw was built with a fully integrated cockpit liner, which gave the boat a finished appearance. The stringer system was bonded to the hull, and the hull and deck were joined using Plexus adhesive. Lamination materials included vinylester resin, end-grain balsa and various layers of fiberglass material. A white plastic rubrail capped the joint between the hull and deck, and protected the shiny three-color gelcoat from getting dinged at the docks. Mold work was clean and free of significant waves. Well-adorned with hardware, the 30 Outlaw featured four Accon Pull-Up cleats, a powder-painted aluminum deck rail and an aluminum swim platform with a ladder. A screw jack raised the engine hatch/sun pad for access to the big-block engines. The motors were strongly secured on what appeared to be a GIL Marine system mounted on the stringers, which we could see (as listed in the lamination schedule) were bonded to the hull. We wished the builder had taken the same pains to secure and support the wire looms. Steering hoses for the first-rate Latham hydraulic system deserved better treatment than merely being laid into a trough outside the stringer. The rigging wasn't shoddy or below production-boat standards. But it wasn't up to par with what we observed about the 30 Outlaw. If the 30 Outlaw truly is an "entry-level" twin-engine boat, Baja has raised the bar on what entry level should be. From the snap-in-carpeted cockpit to the appropriately dressed cabin, the builder cut no corners. Take the rear bench. Where another builder might have gone with a straight-back, no-frill seat, Baja opted for a sculpted version. More than eye-candy, the bench, which had a stowage locker beneath its bottom cushion, had passengers seated well below the softly padded gunwales. It felt secure, pure and simple. For the driver and co-pilot, the builder opted for heavy-duty bolsters with manual dropout bottoms. Up or down, the bolster bottoms snapped into position with a positive thwack, and didn't wiggle or budge in rough water. Molded and angled footrests also were provided for the driver and co-pilot. The co-pilot's station was on the port side of the boat. An elliptical grab handle, cupholders and speakers for the stereo system were mounted on the port gunwale. Inside the lockable, draining glove box/cooler in the dash was a 12-volt receptacle that could be used for charging cell phones. The builder split up the throttles and shifters at the starboard helm station, with the shifters on the left side of the dash and the throttles on the right. Those controls were from Livorsi Marine, and privately labeled for Baja. Also from Livorsi were the gauges, which were organized by engine, in blue rims without bezels. For foredeck access, Baja took the time to mold steps into the helm station. The builder even included a grab handle to help with the climb and surfaced the top section of the dash with nonskid. 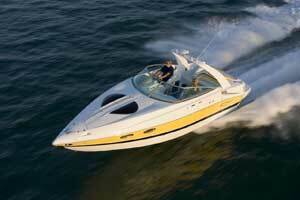 For a 30-footer, the boat had exceptional cabin space and amenities. A large head locker with a portable commode was located on the starboard side of the boat. Opposite that locker was the galley, complete with a Norcold refrigerator, a stainless-steel sink and what appeared to be Formica countertops. Baja does tremendous volume and despite that, the manufacturer still manages to turn out solid offerings. 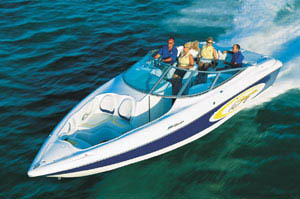 The 30 Outlaw is a strong model at an appropriate, perhaps even bargain, price. 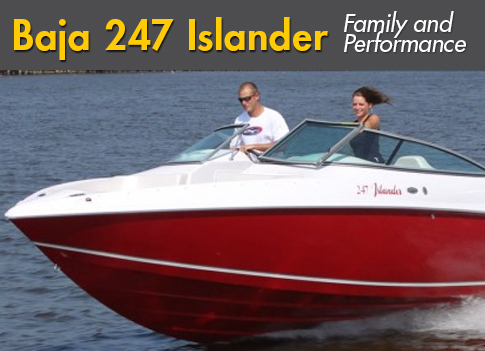 It's a solid offering for a former single-engine boat owner looking to take the next step. Propellers Lab-finished Mercury Bravo One 15 1/4" x 28"
Upgrade to MerCruiser 496 Mag HO engines ($27,700), SST package ($7,300), Corsa Quick and Quiet ($4,300), aluminum swim platform ($3,283), lab-finished propellers ($2,233), DC galley package ($2,150), Clarion Performance Plus stereo system ($2,150), cockpit carpet ($683), Livorsi GPS speedo ($642), freshwater flush ($525), depthfinder ($483), remote and cable adapter ($342), fume detector ($267), compass ($267) and fender holders ($233).